Just curious how many people here, are doing the 72hour Facebook boycot? What boycott? I haven’t heard of one. I’m sort of doing it. Break from facebook is a good idea anyway. So why not stay off of it for 72 hours with a good attempt or reason? May not even to back. AR groups are really the only good thing on facebook. And we got one right here now. Just logged out and am dark until 00:00 Wednesday. Havent been back on FB since they closed all the gun groups. 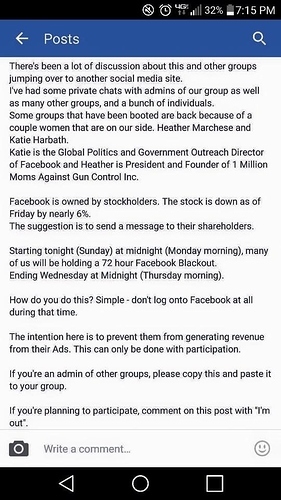 Screw FB and their liberal ways! Wish I would have seen this earlier… I already blew it. I guess there is a bigger and more planned out one in march. When i log back in tomorrow or the next day i will share the link on the builders page. I will watch for it. Not sure if we’re ‘big enough’ to make an impact, but we have to try.